Mick Jagger, L’Wren Scott, Rachel Weisz and Naomi Watts are among the concerned celebrities who have contributed generously to Dr. David Colbert’s efforts to raise funds and awareness for Haitians who lost limbs in January’s earthquake. They all appeared last Thursday in New York City to help host a benefit for Hanger, Inc., the largest designer and distributor of prosthetics in the world. The money raised will help Hanger continue to bring replacement limbs and crucial medical care to the more than 5,000 Haitians who lost arms and legs in the earthquake. One of the evening’s highlights was a live auction featuring signature guitars rounded up by Mick from his friends Bono, Keith Richards, Bob Dylan, Bruce Springsteen, Bryan Adams… and a red Baby Grand piano signed by Mick himself. Shortly after the earthquake in Haiti, teams of doctors volunteering to help made their way to Haiti with supplies and equipment for field hospitals. The horrific result of this particular earthquake and its impact on a country of fragile buildings led to an unprecedented number of amputations – the current estimate is upwards of 5,000 people. In other major earthquakes, lost limbs have numbered in the hundreds, not the thousands. One of those doctors was Dr. David Colbert, a NYC-based dermatologist and internist who also has experience as an emergency room physician with advanced wound care expertise. Trained in France, he speaks fluent French and has learned enough words in Creole to make an enormous difference to the frightened patients he encountered early in the crisis, who were coping with crushing injuries and serious infections in broken limbs that made amputation the only option. Some had waited for treatment for several days and their limbs now could not be saved. Colbert assisted in several emergency amputations, including one for a young man named Wilfred who insisted he’d rather lose his life than his leg. It was Colbert’s job to convince him otherwise, and he promised the skeptical Wilfrid he’d find him a state-of-the-art prosthetic. The boy was wheeled into surgery. Colbert came back to NY determined to raise awareness and money for prosthetics and the related services that make them work in a country where low-tech is the approach of choice because of issues with money, infrastructure and skills. He reached out to the Ivan Sabel Hanger Foundation, allied with Hanger Orthotics and Prosthetics, the world’s largest maker of prosthetics , and decided to partner with them to make it happen. Back in New York, designer L’Wren Scott, a friend of Dr. Colbert’s, enlisted the help of her boyfriend Mick Jagger to spearhead a benefit that will take place on Thursday, May 6. Together with Dr. Colbert, Reed, David Scott and other members of the doctor’s newly-formed foundation, they have attracted a large group of celebrities who are lending their names, donating goods for an auction and giving money for the cause. Among them are Rachel Weisz, Catherine Zeta Jones, Michelle Williams, Sienna Miller, Jude Law, Helmut Lang, John Currin, Rachel Feinstein, Naomi Watts, Zac Posen, Christopher Niquet, Edie Falco, and Margery and Ted Mayer. Auction items include art and photography, couture gowns and jewelry, guitars signed by Jagger and the Rolling Stones and a number of other special donations from artists, designers and musicians. 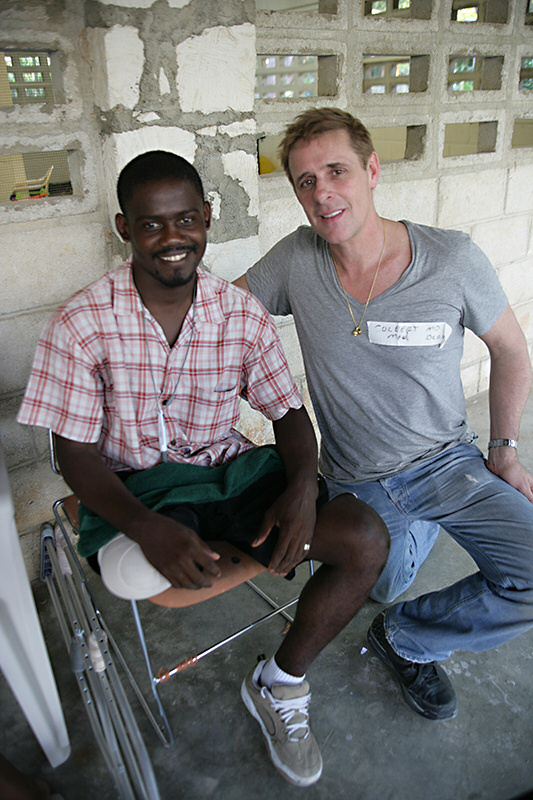 Dr. David Colbert’s humanitarian trip to Haiti after the earthquake inspired him to ask his contacts in New York to help host a benefit for the 5,000 earthquake victims who lost limbs. In association with Hanger, Inc., the largest maker of prosthetics in the world, the benefit will feature live and silent auctions with covetable items like guitars signed by The Rolling Stones, Bono, Bob Dylan and The Boss; art and photography; designer dresses and bags… even an exclusive Mediterranean cruise. For a complete list of auction items, or to donate $ for the people of Haiti who still await replacement limbs, please visit www.nydgfoundation.org. And watch here for a preview of the loot available both live and on line at the auction! Guaranteed: you’re gonna get it for a song!!! Proceeds from the event will provide prostheses for earthquake victims who suffered loss of limb: now identified as the major ongoing medical need of survivors. The evening will include music, cocktails and an auction featuring the works of major artists and photographers, clothing, jewelry and other special donations. Shortly after the earthquake, Dr. Colbert (an internist as well as a dermatologist, with a fellowship in wound healing and ER experience) visited Haiti to help treat the countless victims of the disaster. His accounting of his trip , and his assessment of what medical follow-up would be needed in the future, was published in The New York Post on February 7. The article drew attention from many prominent people anxious to continue helping the Haitians recover from the devastation, and led to the establishment of Dr. Colbert’s not-for-profit organization, NYDG Foundation. A benefit hosted by Dr. Colbert and several celebrities will be held in April. Link here to The Huffington Post to read how you can help the Haitian earthquake victims, and for details about the event.